The applicability of Pulse Phase Thermography (PPT) for the investigation of building structures is studied in the frame of a DFG (German Research Foundation) funded project. We have applied PPT for the investigation of concrete specimens with voids in near surface regions. The voids are implemented in different depths and with different sizes, representing voids, honeycombing, delaminations of plaster at concrete and masonry and delaminations and voids behind tiles on concrete embedded in mortar. The method is contactless, fast and allows the inspection of broad surface areas. The heating process with an external radiation source as well as the recording of the surface temperature is the same as for Impulse Thermography (IT). In PPT the transient behaviour is analysed by Fourier Transformation, separating the information according to different frequencies of thermal waves and delivering amplitude and phase images. Especially the phase images provide a deeper probing with maximum available depths in the order of magnitude of 10 - 15 cm. The results by PPT are compared with results of IT and as well with radar data. Pulse Phase Thermography (PPT) is well known for non-destructive testing. It combines features of Impulse Thermography (IT) and Lock-in Thermography (LT). The experimental set-up and data acquisition are identical for IT and PPT. (Applications of Impulse Thermography in Civil Engineering are described in detail in the NDT-CE 2003 contribution of G. Wedler "Active Infrared Thermography in Civil Engineering - Quantitative Analysis by Numerical Simulation"). But image analysis is different in IT and PPT, where analysis is done in the frequency domain similar to LT. In a Lock-in Thermography experiment the object of investigation is heated by a sinusoidal modulated radiation of a given frequency w . During the steady state stimulation an infrared camera records the thermal response. The time delay (phase) with respect to the stimulation is analysed, sometimes also the amplitude of the response. A Lock-in Thermography experiment has been used to determine the surface moisture of building materials. In PPT each pixel (i,j) of a series of thermal images, which describes the transient cooling down behaviour of a specimen after a heating pulse, is analysed by application of the Fourier Transformation. Basic research on PPT has been accomplished in the group of Maldague, who reports about principles of PPT and gives a comparison between PPT, IT and LT. The method was tested on pecimens made from aluminium and different kind of polymers. Up to now, to our knowledge PPT has not been applied in civil engineering. By application of PPT on concrete specimens the thermal material parameters and therefore the time scale of the experiment are the main difference to previous works. As concrete has a low thermal conductivity compared with metals and the dimensions are much larger than for plastics and laminates, the duration of the heating pulse applied to concrete is in the scale of minutes instead of some milliseconds, the cooling down process is observed for 30min to 120min, instead of some seconds. Otherwise the size of the concrete specimens and the defects is greater, e.g. defects 10cm deep under the surface have to be detected, not only covered by a few millimetres. Within the scope of a national project funded by the DFG (German Research Foundation) the application of Impulse Thermography and Pulse Phase Thermography as non-destructive testing methods in civil engineering are investigated. In a co-operation work between the Technical University of Berlin and BAM the technique is intended for the detection of near-surface inhomogeneities and common subsurface defects in typical structural elements and for the determination of their geometrical parameters. In this research project practical problems like locating voids and honeycombing in concrete, delaminations of plaster at concrete and masonry, delaminations and voids behind tiles on concrete embedded in mortar and interconnection of carbon fibre reinforced laminates glued on concrete are analysed. The influence of different grades of reinforcement, of different surface properties and of the moisture content will be investigated. In this paper, the results of PPT concerning a concrete test specimen containing voids with different sizes at various depths and a concrete test specimen with delaminations and voids behind cleaving tiles will be presented. The experimental set-up consists of a thermal heating unit, an infrared camera and a computer system, which enables digital data recording in real time, and is described in detail elsewhere[4,5,6,7]. (b) Experimental set-up for Impulse Thermography and Pulse Phase Thermography. The thermal heating unit contains three infrared radiators having a power of 2400W each. The heating procedure is usually done dynamically by moving the radiators computer controlled in a distance of about 15cm to the surface to obtain the best possible homogeneous heating. The heating time varies between 3min to 60min, resulting in a surface temperature not higher than 50°C, whereas the ambient temperature accords to room temperature. The cooling down process of the surface is observed with an infrared camera (Inframetrics SC1000, 256 x 256 Pixel). The camera detects the emitted radiation from the surface of the specimen in a wavelength region from 3 to 5mm. Normally the observation is accomplished for 120min. The time interval between the thermal images in the saved sequence is 5 s.
The data are transferred to a computer in real time with a storage depth of 12 bit of each pixel. After receiving the thermal images the computer is also used to analyse the data with dedicated software programs, either in the time domain (Impulse Thermography) or in the frequency domain (Pulse Phase Thermography). The heating pulse causes a non stationary heat flow. The propagation of the heat depends on the material properties like thermal conductivity, heat capacity and density. If there are inhomogeneities in the structural element with different thermal properties, the heat flow will slow down or accelerate in these local areas. While observing the temporal changes of the surface temperature distribution with the infrared camera, near surface inhomogeneities will be detected if they give rise to measurable temperature differences on the surface. Deeper probing. (For LT it has been demonstrated, that phase images can probe roughly twice the thickness probed by amplitude images[8,10]). Less influence of surface infrared and optical characteristics, that also means less sensitivity to non-uniform heating, is seen in phase images compared with thermal images and amplitude images[9,10]. (In LT the phase image is related to the propagation time delay of the thermal wave and is therefore independent of surface features). Rapid image recording (surface wide inspection)[3,9,10]. Non-necessity to know a priori position of non-defect area[3,9,10]. (This is necessary for the computation of contrast images, which is usually done in IT). Phase processing of thermal images improves the visibility, if not the detectability of defects. Amplitude images show the internal structure of a specimen up to a maximum available depth depending on the frequency (low pass filter behaviour). Phase images show the internal structure within a certain depth range depending on the frequency (band pass filter behaviour)[3,9]. In our experiment the heating pulse is represented as a square pulse, which can be described as superposition of different frequencies with varying amplitudes. The available energy is concentrated in the low frequencies. The pulse duration determines the frequency spectrum in that way, that for longer pulses lower frequencies contain more energy and therefore more information. This is exceedingly true for the long pulse durations necessary for the investigation of concrete. The maximum frequency is determined by the acquisition rate, the minimum frequency is limited by the duration of the heating pulse. In practice only the first few frequencies are of interest, since most of the energy is concentrated in the low frequencies. Higher frequencies exhibit a higher noise level. For a quantitative depth evaluation by using the phase information different approaches have been reported. Vavilov and Marinetti state that there is a significant dependence between the depth of a defect and the frequency necessary to reveal the defect. They propose phase - defect depth calibration curves resulting from calculations describing the system as 2-dimensional cylindrical problem. Furthermore they conclude that phase images provide information about depths two times deeper than amplitude images and that a material can be depth-probed only within the limits of certain sample thickness. The thermal diffusion length indicates the length at which the amplitude of the thermal wave has been damped to 1/e of the original value. Approximately up to this depth the thermal wave has enough energy to give a signal on the surface. The depth resolution can be tuned in LT depending on the modulation frequency w , low frequencies allowing a deeper probing. In case of PPT the modulation frequency is not known, as a multitude of frequencies are contained in the heating pulse. But the calculated frequencies of the thermal waves can be compared with the thermal diffusion length for the same value of modulation frequency in a LT experiment. Approaches for a quantitative depth determination with PPT have been accomplished with neural networks[11,12], statistical methods and wavelet transformations[14,15],. In wavelet transformations the temporal information is not completely lost as in Fourier Transformation. With the wavelet transformation two parameters become available, a translation factor and a scaling factor. Calibration of the translation factor provides a direct inversion of the defect depth for a given scaling factor. Here, we have estimated defect depths by means of the thermal diffusion length. In this paper we present results obtained from a concrete test specimen with voids and from a concrete test specimen with a tiled surface with delaminations. Schematic drawings of these specimens are shown in figure 2. The concrete test specimen with voids (figure 2(a)) has incorporated faults made of Polystyrene foam, representing compacting failures and defects. The Polystyrene bodies vary in size, shape and depth inside the specimen. In table 1 the intended depth for incorporation is given as well as data obtained from radar measurements. Some of the Polystyrene bodies (defects number 3 and 4) are not oriented parallel to the surface, but have a canted orientation. Defects are induced areas of lacking mortar. The concrete test specimen with cleaving tiles has well defined induced delaminations, the positions are shown in figure 2(b). The cleaving tiles are 8 - 10mm thick, the variation resulting from a rippled rear, which should provide a good bond between the cleaving tiles and the mortar. The tiles are embedded in thick bed mortar, which has a thickness of approximately 20mm. Therefore we have a system with three layers (cleaving tiles, mortar and concrete), with defects either between tiles and mortar (defect 1 to defect 9, defect depth approximately 8 - 10mm) or between mortar and concrete (defect 10 to defect 12, defect depth approximately 30mm). Table 1: Concrete test specimen with voids. Fig 3: Transient cooling down behaviour after a 30 min heating pulse applied to the concrete test specimen with voids (figure 2(a)). Observation time 120 min. In figure 3 the transient temperature decay after a 30min heating pulse is shown for two positions of the concrete test specimen with voids, one above a defect (defect 4 in figure 2(a)) and the other above a sound area located close to the defect. For these transient curves the FFT has been calculated. The amplitude spectra are shown in figure 4(a), the phase spectra are shown in figure4(b). The differences in amplitude for data corresponding to a defect and a sound area can be seen, as well as most of the information is contained in few low frequencies. This last property is similar for the phase. Fig 4: Amplitude spectrum (a) and phase spectrum (b). A 30 min heating pulse was applied to the concrete test specimen with voids. Observation time 120 min. It can be seen, that the values at low frequencies show most information. The frequency step and the maximum frequency can be calculated from the experimental parameters. E.g. the cooling down process after 30min heating of the concrete test specimen was observed with a time step of 5 s and a total number of 1438 thermal images was recorded, according to an observation time of 7190 s. Therefore the frequency step amounts to 0.14mHz and the maximum frequency is 100mHz. In figure 5(a) and figure 5(b) amplitude and phase images are shown, respectively. These are subsequent images of the amplitude and phase sequence. For both the image corresponding to the lowest frequency (0.14 mHz) provides the best visibility of the defect areas. For higher frequencies the deeper defects (defect 1 and defect 2) vanish. This effect occurs at lower frequencies for the amplitude images (0.42 mHz compared with 0.56 mHz). This behaviour is in accordance with the observations of Maldague and others, that phase images provide a deeper probing. 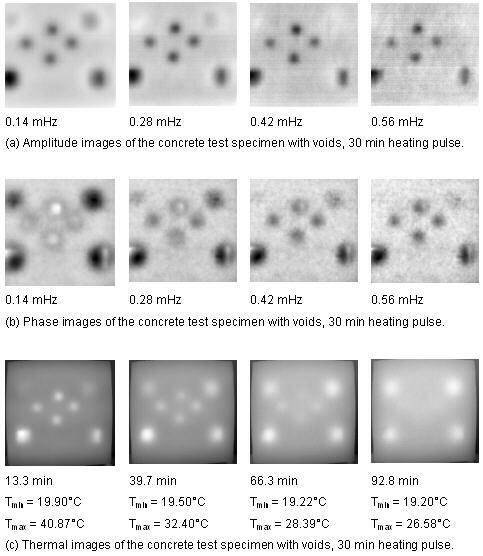 Fig 5: Amplitude (a), phase (b) and thermal (c) images of the concrete test specimen with voids. Fig 6: Phase images of the concrete test specimen with cleaving tiles and delaminations. In amplitude images all defects occur darker than the surroundings, the contrast is decreasing before they are indistinguishable from the surroundings. In phase images the defects are either darker or brighter as the sound areas, which depends on frequency and depth. Additionally the phase images show the defects with better contrast compared with amplitude images at the same frequency, especially the deepest defects. The defects with a canted orientation in respect to the surface (defect 3 and defect 4) can be identified in the phase images. As they seem to be half black and half white it can be deduced that one corner is much deeper than the other. This effect is in accordance with a better geometrical resolution of phase images. Compared with thermal images (figure 5(c)) phase images provide the advantage that all defects can be clearly seen in the same image, best in the image at the lowest frequency. Defects occur in thermal sequences after a certain time, which depends on the depth. Therefore often not all defects are visible in the same image but the whole thermal sequence has to be evaluated. In figure 5(c) it can be seen that the small defects (defects 5 -8), which are covered by 3 - 4.5 cm of concrete are seen best at the beginning of the thermal sequence (after about 15 min), as well as the big voids (defect 3 and defect 4) with the canted orientations. The latter are still visible after a longer observation time. In contrast the small defects show a worse signal and cannot be identified after a certain time (about 80 min). The deep defects (defect 1 and defect 2) cannot be seen at the beginning of the thermal sequence, but become clearer with time. 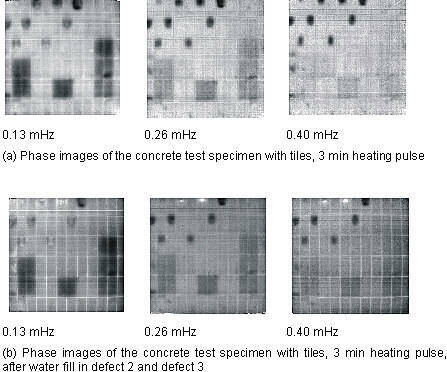 In figure 6(a) phase images of the concrete test specimen with cleaving tiles are shown. Similar to the results obtained for the concrete test specimen with voids all defects can clearly be seen in the same image, in this case at 0.26mHz. All defects (delaminations) appear darker than the sound area as the defect depth (approximately 10 mm or 30 mm) is much lower than for the concrete test specimen with voids. 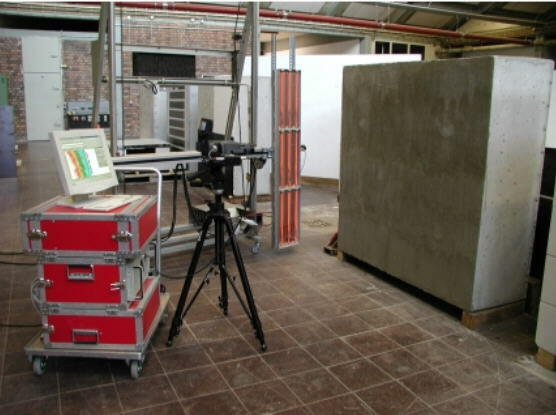 Although the concrete test specimen with cleaving tiles represents a different problem in the investigation of building structures the same features as described before can be observed. To study the influence of moisture two defects have been filled with water. Measurements have been accomplished with a 3 min heating pulse directly after the water was filled in. In figure 6(b) the phase images are shown, which have been calculated for the measurement directly after water filling. The effect is most prominent in the images at higher frequencies. The defects filled with water do not appear darker than the sound area but brighter. Pulse Phase Thermography proves to be useful for applications in civil engineering. The properties of PPT in CE are in accordance with previous works on materials with higher thermal conductivity. Images in the frequency domain facilitate the visibility and detectablity of defects. Phase images show only slight influence by surface inhomogeneities and non uniform heating. The geometrical configuration of the defects can be determined from phase images. Semi-quantitative estimation of defect depths by analogy with the thermal diffusion length results in the right order of magnitude, but further theoretical work has to be done for quantitative determination of defect depth. The presence of moisture inside a specimen has a clear influence on the phase image. In the frame of the DFG funded project further systematic investigations will be accomplished. Additional test specimens will be investigated by means of PPT, e.g. carbon fiber reinforced laminates glued on concrete, plaster with different depths, voids with different geometries. The influence of reinforcement and surface properties will be studied. The presented work was supported by the DFG within the research project"Investigation of structure and moisture content in the surface near region of building structures with impulse thermography, part 2".